Add the Poison Help line to your phone – it could save a life! March 15-21, 2015 is Poison Prevention week – if you do one thing, program the Poison Help telephone number in your phone: 1-800-222-1222. You never know when it could come in handy for you or someone else. Calls are free and confidential and can be translated into 161 languages. Most calls can be handled over the phone and don’t require a hospital visit. Plus, you can call for information about chemicals and their safety, too – a call doesn’t have to be for an emergency. In 2013, America’s 55 poison centers received over 3.1 million calls. Of those, about 2.2 million were calls about poison exposures ranging from carbon monoxide to snake bites to food poisoning. The rest were calls for information. Although children younger than 6 accounted for about half of all the poison exposure calls to poison center in 2013, adults accounted for 92 percent of all poison-related deaths reported to poison centers. The AAPCC offers this chart to help poison-proof your home. Button batteries are toxic and may cause serious injury to your child if swallowed. We find these micro batteries in more and more common products from remote controls to greeting cards. While some used in toys are secured, many are more accessible and parents need to take particular care to keep products with batteries away from small children. Single portion laundry packets are also alluring to young children – they often are packaged in bright, colors, are squishy to the touch and also smell good. They are attractive and may seem like candy or toys to kids. It’s important to store them properly. 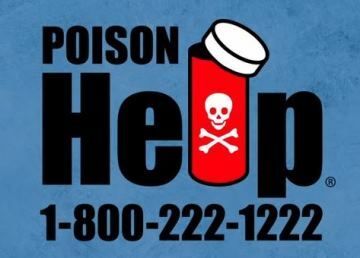 Calling 1-800-222-1222 will connect you to a poison center that serves your area. Poison centers are open to take your call 24 hours a day, 7 days a week, 365 days a year, in 161 languages, as well as from the hearing impaired. You can also find a Poison Center near you on this clickable map. Over the weekend, a NY restaurant manager quickly succumbed to carbon monoxide (CO) poisoning and another 28 people were rushed from the restaurant and treated for symptoms. The CO leak was serious enough that first responders felt light-headed on entering the building. A few days later, a tragedy-in-the-making was narrowly averted at a time-share resort in Ogunquit Maine, where 21 people were poisoned by CO. You can read the scary story of a Connecticut couple who were poisoned and nearly succumbed. They experienced flu-like symptoms and lethargy. After the man passed out and broke his nose, they left their room to go to a drug store. On the way, they told the the front desk manager about their symptoms. His wise call to 9-1-1 probably saved 21 lives. And now we hear that an Idaho family of four likely died of CO poisoning. These experiences highlight the importance of having working CO detectors in both residences and public buildings. Every year, an estimated 400+ people die from carbon monoxide poisoning and thousands more are treated at hospitals. Often called “the silent killer,” CO is an odorless, colorless gas that can leak when fuel-burning appliances like space heaters, water heaters, and generators malfunction. It can also build up quickly when cars, grills, lawn-mowers and other fuel-burning machines are used in confined spaces. If you don’t have one, here’s a consumer guide for How to Buy a Carbon Monoxide Detector. Here are state laws about Carbon Monoxide detectors. If you suspect that you or someone else has CO poisoning, seek fresh air immediately and call 911. Schedule annual maintenance on home heating systems, including furnaces, fireplaces, chimneys and other heat sources such as non-electric hot water heaters, to ensure that they are properly-vented and maintained. Install battery-powered CO alarms in your home. Check them twice a year to make sure the batteries are working properly. Checking the CO alarms when clocks are adjusted for daylight saving time is a useful way to remember. Operate portable generators outdoors and downwind of buildings. The U.S. Centers for Disease Control and Prevention recommends a distance of at least 25 feet from the house. Never operate fuel-powered equipment or tools in a garage, basement, or any other enclosed space. Never use a gas or charcoal barbecue grill in your home or other enclosed space. Make sure that non-electric space heaters are appropriately installed and vented, and that they are routinely inspected and maintained. Never run a car or truck inside any garage or structure, even with the door open. Know where boat engine and generator exhaust outlets are located. Keep away from these areas if the boat is idling. Even seemingly innocuous over the counter medication can be harmful to a child – test your own ability to spot the difference in this Pills or Candy interactive quiz — and if you pass Level 1, move on to Levels 2 and 3. The point of the game is to raise awarness about how attractive medications can appear to toddlers. March is Poison Prevention Month, which has a goal of raising awareness of the dangers lurking in our homes. More than 60,000 young children end up in emergency departments every year because they got into medicines or household products while parents or caregivers were not looking. 90% of poison incidents happen at home in kitchens, bathrooms, bedrooms, and laundry rooms; more than half of all incidents happen to kids under the age of 6. The Label It Foundation reminds us that poisonings can happen to people of all ages – they offer a sheet that breaks down age groups and the most common types of accidental poisons for that age group. Here are some resources. If you have kids, these will help you keep you do a home audit to ensure your kids are safe. Even if you don’t have kids, why not help spread awareness by posting infographics, fact sheets or games on your Facebook and Twitter pages?